Just a very quick and dirty post with a nice picture. Owls are famous for their ability to swivel their heads alarming distances, but while they might be the best proponents of this, they are far from the only ones. 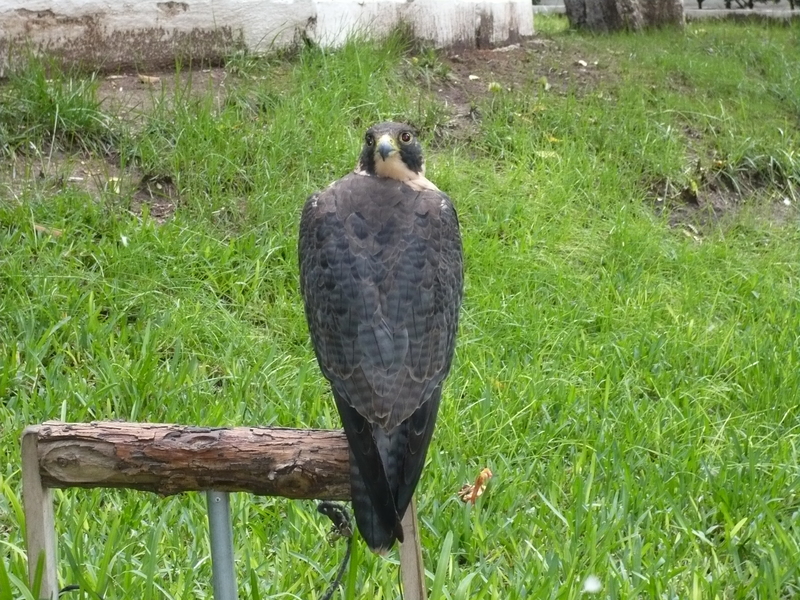 This is a nice little picture I took of a peregrine falcon at the Museo de los Aves in Saltillo (more to come on this place soon-ish). As you can see, the head is a full 180 degrees rotated from the front, and in fact later on the bird stretched this even further round though I didn’t get a great shot of it. A new pterosaur website on the way! This is just a little teaser post for the near future. One unintentional, but perhaps inevitable, recurring theme here has been my ‘why aren’t pterosaurs given the same treatment as dinosaurs’ posts. Of course I understand that dinosaurs are bigger, better known, the subject of far more research, are known from far more fossils and with far more species etc. I am not a fool in imagining that the average journalist or 10-year-old should give equal space to pterosaurs and dinosaurs, but when looking at the former, but I can’t understand why they are perceived in such a different manner to their terrestrial brothers. One noticeable aspect is the amount of web space devoted to pterosaurs. With a couple of notable (but hardly mainstream) exceptions, the pterosaurs barely exist on the net, except when appended to a dinosaur site. There are hundreds of dinosaur sites (and various blogs, Facebook groups, dedicated chat-rooms etc.) many of high quality, yet the pterosaurs are once again left out in the cold – until now! Yes a group of us have got together (including yours truly) to correct this travesty with a brand new and spanking pterosaur website written by a big gang of ptero experts (and me). We have Dr’s Dave Hone (me), Darren Naish and Lorna Steel with further contributions from PhD students Ross Elgin, Mark Witton and Mike Habib. To top it off and make sure it looks all sparkly and nice Mark is contributing his artwork as are palaeoart mainstays John Conway and the fantastic Luis Rey! In addition of course to lots of photos of pterosaurs that have been offered up by various collections and researchers. The pterosaur legend that is Professor ‘Dino’ Frey has also pitched in with some information on German and South America species for us. Of course I’ll put up more when the site is formally launched, but hopefully this will whet a few appetites for now. Basically we want to ensure that there is a single great site up and running providing up-to-date info on pterosaurs and their history as written by experts in the respective fields. Hopefully we can shake loose a few of those misconceptions that keep creeping out. You know, the ones I complain about every single week….. I have seen plenty of field reports, heard plenty of tales over a drink or two, read numerous books and have done plenty of ‘wild’ travel myself. However, in terms of specific advice about working in the field, here are 10 things that were never mentioned and wish they had been. So reader, I hereby impart some words of wisdom, that those who follow me do not fall into similar traps. Today we were out at the local site known as Gomez, trying to hunt down some elusive marine reptiles in a Late Jurassic section. Plenty of beautiful ammonites were in evidence, lots of bivalves and oysters, some wood and not much else. Still the exposures we were checking had been well covered and really the trip was about working out the viability of a long term dig to get at the layers below after the bones we know are there (several nice skeletons have already been recovered). Sticking with a theme, there is not much to tell from the field as of yet, though today we got to look over the as yet largely unexploited dinosaur site at Las Aguilas, near Salltio. 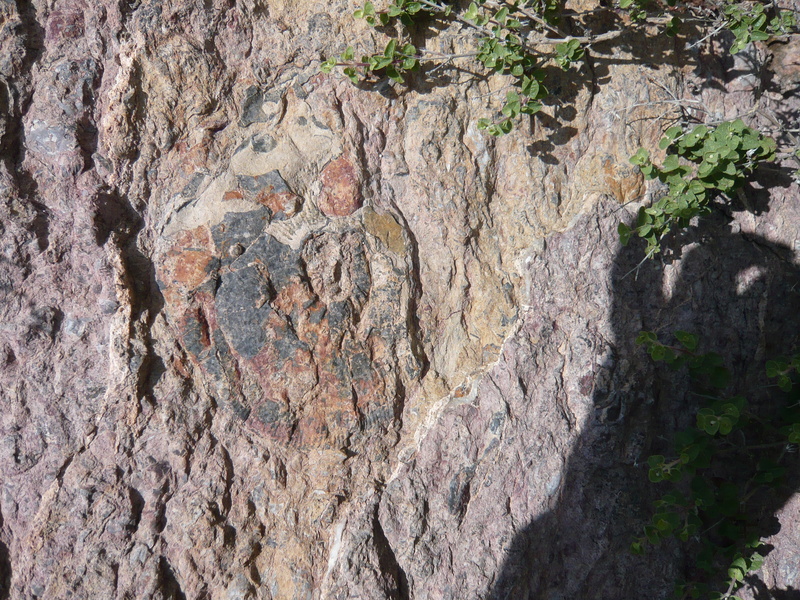 This has a series of footprints of sauropods, theropods and large ornithopods and even though we were limited to looking at scraps and broken peices on the surface, it was enough to identify sauropods, two different theropods and a large ornithopod. Not bad when you consider the state of the material and the amount of time we had. One obviously hopes that under the slopes and hills there are plenty more peices that have yet to weather and break. One remarkable feature of the material was how good the condition was even for the badly broken bits that suggests the original might be superb, one can only hope. Further exploration and exploitation is planned here, but as ever we are reliant on funds and permits. Still, the prospects are good. Last night following a series of long discussions and a fair amount of tequila and rum Dino Frey decided it was time to get in on the act of blogging, and thus a new blog was born. Not bad really given the time of night, though as you will see it was hadly the biggest launch in history. Dino and I are of course in mexico, so who knows when we will next get online and have a chance to write up soem of this, but I am very pleased he has chosen to take the plunge. 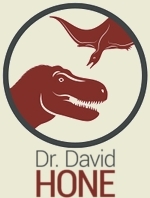 He is one of the leading experts in pterosaurs (in addition to having published on crocodiles, fishes, ammonites, homonids, sauropods, and others) and loves his biomechanics and functional morphology among much else. I am sure he will soon be in the swing and throwing out interesting posts. For now though, you´ll have to settle for a photo of him standing next to one of our field trucks which has possibly the best palaeo bumper sticker ever, even if it is a bit faded. More soon. Ish. Probably. My last two posts on ‘How to write a paper‘ and ‘How to complete a PhD‘ will probably be my last for a while. 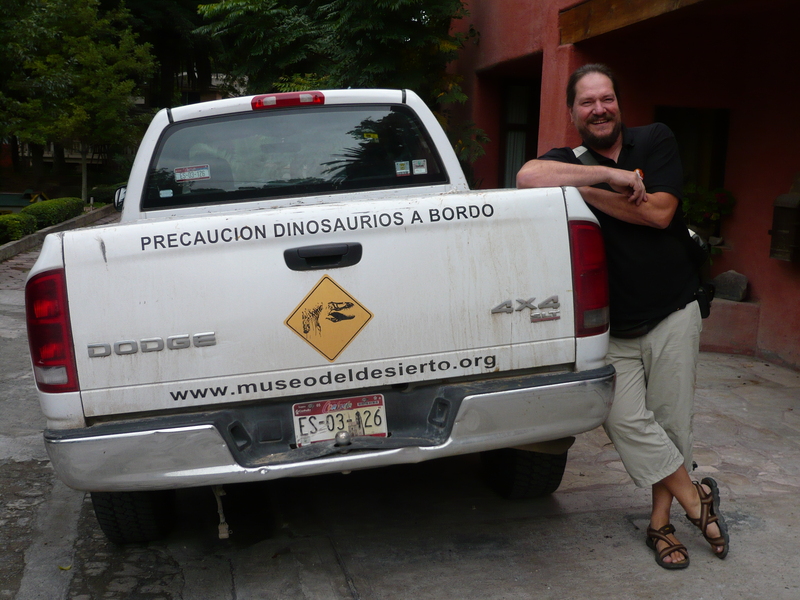 For those who have been paying attention, I am off to Mexico in the next couple of days for a combined fieldwork trip / break with my pterosaurologist (copyright Dave Unwin) friend and colleague Dino Frey. 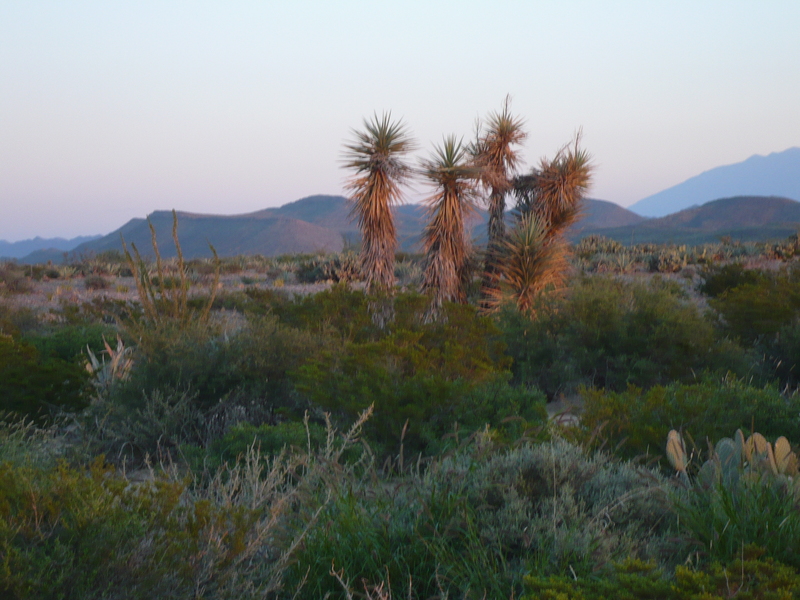 We are out to hunt down various Mesozoic vertebrates in a range of beds and localities in Mexico and I am looking forward to it immensely. I would say more, but frankly, I am not sure where we are going or what we are looking for exactly as I am just a spare set of hands on the job and it’s Dino’s project. While I try to avoid this normally, there are quite a few themes that I have touched on in recent posts that I have not been able to follow up on. Since I am again going away and will be unlikely or unable to post on here for a while (though access should be better in Mexico than Inner Mongolia) the Musings are likely to be quiet for a time. Thus my flurry of posts in the last week and the promise of many more on my return I hope will keep readers intrigued enough to remember to come back in a month. There are still posts to come on what archosaurs actually are (something I should have addressed long ago), more on pterosaurs (inevitably), a proper review of my time in Inner Mongolia and the work that was done there, some new posts being prepared on dinosaurs, and of course I’ll be covering my Mexican forray too. So do check back periodically to see if I have been able to get something up, and do remember to come back in October if not.